Our burp cloths are super thick, absorbent, gauze weave diapers with darling high quality appliqué. They are machine washable and are very durable. 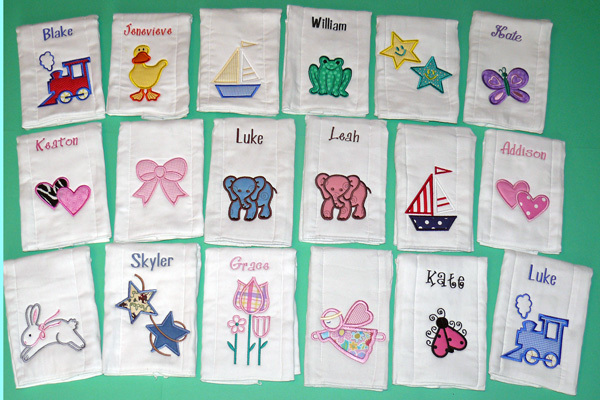 These decorated burp cloths are the perfect alternative to a plain white drool cloth for proud parents’ shoulders! They become many babies’ favorite “lovey” or snuggle blanket after the “burping” stops. Our daughter, Brooke, slept with her favorite ones for years and now our son does the same. Packaged burp cloths make very unique and appreciated gifts. New lower price.